সেই ধূলি হায় কখন আমায় আপন করি’ লবে? When will that dust alas accept me as one of its own? They too will then know me on sight. This entry was posted on September 4, 2014, in Prayer/Puja. Once there was a bird. It was uneducated. It used to sing, but it had never read the scriptures. It hopped about and it flew but it did not know what good manners were. The duty of training the bird fell upon the shoulders of the king’s nephews. The learned men sat and discussed at length why the accused creature was versed in the wrong kind of knowledge. They concluded that the nest the bird built out of ordinary straw was not enough to hold a great deal of knowledge. Thus the first thing needed was the construction of a good cage. The pundits went home happily with their grants from the king. The fellow got a sack filled with money as payment. He set off for home in high spirits immediately. The scribes had to carry their rewards home by bullock cart. They went back quickly too. From that day onwards there was no more need in their homes. Many people had to be employed and many other people were engaged to keep an eye on the first lot of employees. This army filled their coffers with fistfuls of cash each month. They and all the cousins they had of every hue were now able to behave like men of means and leisure. The king understood exactly what was going on and gifted a golden chain to his nephew immediately. The king expressed a wish to see for himself how the great education of the bird was going. One day he arrived at the classroom with all his courtiers. At that very moment the gates rang out with conch shells, bells, drums of every kind, cymbals, flutes and gongs, The learned men were loudly reciting the lessons , their sacred tufts of hair shaking with the effort. There was a welcoming roar from the masons, the goldsmith, the scribes, the overseers and their supervisors as well the various cousins. He went and saw. It pleased him greatly. The pomp surrounding the bird was so great that it was hardly to be seen. And to tell the truth, it did not seem that important that one saw the creature. The king understood that there was no lapse in the arrangements. There was no food in the cage, nor any water; but the pages of a hundred wise tomes were being stuffed into the bird’s mouth. It was unable to open its beak even to shriek, let along sing. It was truly thrilling. This time while mounting the elephant, the king told his principal ear-boxer to box the ears of the critic very soundly indeed. The bird grew more and more civilized each day as its life drained away. Its guardians understood that the situation was very encouraging. And yet the bird still fluttered its wings most annoyingly each morning as it gazed upon the morning light, thanks to its intemperate nature. 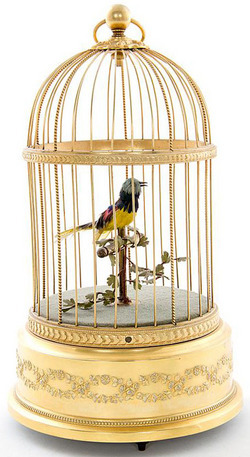 It was even observed that on some days it tried to gnaw through the bars of its cage with its puny beak. The blacksmith was brought to the schoolhouse, complete with his bellows, hammers and furnace. With a tremendous clanging an iron chain was fashioned and the bird’s wings were also clipped. Then the wise men picked up pens in one hand and spears in another and gave a demonstration of real teaching. The blacksmith made so much money that his wife was able to buy herself gold jewellery and the king rewarded the jailer’s vigilance with a title. The bird came. The jailer came with it, as did the guards and the mounted policemen. The king poked the bird; it did not utter a single sound in agreement or in protest. There was just a rustling from the dry paper that filled its body. Outside the palace, the southerly winds of spring sighed among the new buds and drove the skies above the flowering forests quite mad.